For as long as I can remember, there's been a bug in the game that causes the screenshot function to not work properly for some people, me being one of them. I used to be kind of torn about how to feel about it, because on the one hand taking screenshots is hardly a key aspect of gameplay... but on the other hand this is a problem that has been present at least since launch, and I can't believe that they still haven't figured out a solution after nearly two years. Personally I've been affected by this bug in two ways: Firstly, I'm usually unable to take screenshots during cut scenes. It does work on occasion, but there's no rhyme or reason to it and those occasions also seem to be getting less and less frequent (or maybe I've just given up trying often enough). This is annoying because cut scenes are usually the perfect time to take screenshots! There's interesting stuff to see and you're not busy mashing buttons just to stay alive. I remember seeing this awesome cut scene during the consular story that included some great imagery, mashing my Print Screen button like crazy... and was then disappointed afterwards to see that not a single one of them had actually been taken. I've got to take a screenshot of that, Qyzen! The other thing that happens is that sometimes, Print Screen will just stop working entirely. This can at least be fixed by restarting the game, but unless you regularly tab out to check your screenshot folder it's something that's easy to miss. Nothing like lining everybody up for a great boss kill shot, hitting Print Screen and then realising that it stopped working about an hour ago. Argh! Keeping that in mind, I'm not actually sure how I managed to put up with this screenshot bug for as long as I have without looking for a workaround. I guess I was lazy and hopeful that surely this couldn't be something that would take long to fix. Well, nearly two years later and while levelling my upteenth alt I'm finally fed up with it! Simple workaround: I already had Fraps, so I set it up to take pictures when I hit Print Screen and to put them straight into my SWTOR screenshot folder. I used to only start it up when I was planning to make a video, but since it's hardly a resource hog while it's not recording, it shouldn't be an issue to keep it running for screenshot purposes too. 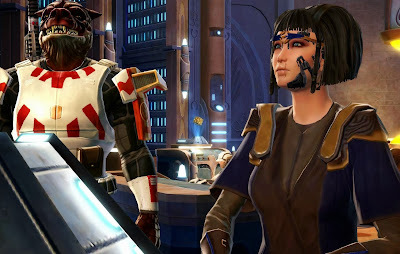 Whenever SWTOR's screenshot function actually does work properly, I now end up with two shots of the same thing, but that's hardly a big problem either. For me, SWTOR actually prints, it's WoW that drives me bananas. Screen shots haven't printed since the big 5.0.1 (or whatever) patch drop. Switching PCs (not due to desire but because the motherboard had been zapped) and going from 32-bit to 64-bit hasn't helped either. I always use Fraps for my screenshots as well. An extra advantage is that you can set it to save all your screenshots as .png, which is of higher quality than the .jpg PrtScrn makes of them. Right now, I wouldn't want anything else. I've been using fraps since the beginning since, for me, the native screenshot functionality doesn't work in cut scenes, which is kind of the important time. Seems this bug is quite widespread, despite of the official response on the forums having been that it's too rare for them to be bothered very much (or something to that extent). And I love the screenies on your headers, wish I could look at all of them in a gallery or something! Thank you for posting this. All this time I thought it was my system causing this problem.